ON Semiconductor has launched the AXM0F243 System on Chip (Soc) for true single-chip wireless applications. The SoC contains the narrow-band AX5043 RF transceiver core and a high-performance ARM® Cortex®-M0+ microcontroller (MCU) core. The AX5043 core is software programmable and is said to be extremely powerful. The company says that the SoC offers the widest array of available modulation schemes and features data rates from 100bps to 125kbps. According to On Semiconductor, with AXM0F243, nearly any Sub GHz protocol, proprietary or standards-based, can be implemented. Potential applications for the SoC include: automatic meter reading (AMR); security applications; home and building automation; industrial IoT and sensor networks; lighting and remote control; wireless applications; smart retail and asset management; as well as electricity meters, water meters, gas meters, data loggers, street light controllers, thermostats, and weather stations. The software programmability of the radio core also allows sharing of a common hardware design for products that have different software loaded, making it easier for customers to manage multiple SKUs. It’s also possible to implement a multi-protocol solution using the device for gateway implementations. The integrated frequency synthesizer can generate any carrier frequency from 27MHz to 1050MHz. For frequencies below 400MHz an external inductor is used by the integrated VCO, but above 400MHz an integrated inductor can be used instead. The company says that the AX5043 receiver is extremely robust and can achieve sensitivities as low as -137dBm, while consuming less than 10mA of current. For applications that demand antenna diversity, an integrated diversity controller is included and can automatically control an external antenna switch via a GPIO pin. The receiver also has a wake on radio feature, which further reduces power consumption by allowing the MCU to sleep as long and as often as possible between radio events. The AX5043 transmitter includes either a differential power amplifier that generates up to 16dBm or a single-ended option for up to 13dBm. The high-performance ARM® Cortex®-M0+ runs at up to 48MHz and has 64KB of FLASH and 8KB of RAM. The MCU contains two independent serial communication blocks (SCBs) which can be configured to do I2C, SPI, UART, etc. The MCU has five 16-bit timers that act as counters, PWM modulators, or pulse generators. There are 19 programmable GPIO pins. 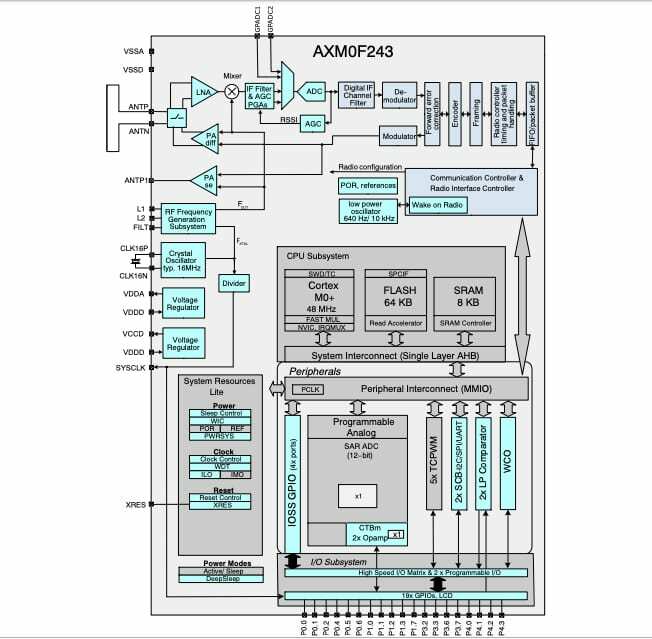 In addition to the extremely powerful MCU core, the AXM0F243 MCU also has compelling and unique analog functionality. There is an integrated 12-bit SAR ADC capable of 1 Msps conversions, with single-ended and fully differential modes. The MCU also contains two current DACs, two ultra-low power operational amplifiers, and two ultra-low power comparators. The company insists that with it’s robust and efficient RF transceiver, and the ARM® Cortex®-M0+ MCU and programmable analog, the AXM0F243 is an excellent choice for low-power and long-range Internet of Things applications.